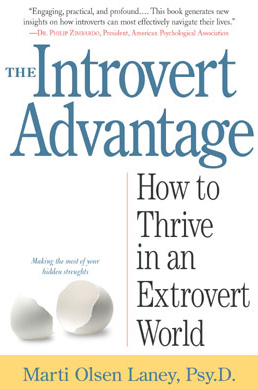 I first mentioned The Introvert Advantage: How to Thrive in an Extrovert World (Kindle Ed. | Paperback ) in a previous post and, as promised here is my review of the book. I used to think something was wrong with me. Why do I have trouble making small talk? Why am I hesitant to answer the phone and then almost paralyzed when faced with the need to return a call? Why do I avoid conflict like the plague? As it turns out, I'm a very normal, run-of-the-mill introvert. The reason I always felt like something was wrong with me is the fact that introverts are outnumbered by a margin of three to one. Ours is an extroverted culture, so introversion is perceived through the lens of extroversion and many misconceptions have formed. The Introvert Advantage is a pleasing mix between a self-help book and a psychology text. It is loaded with scientific explanations and case studies that explain how and why the introverted temperament is determined as much or more by physiology as it is by psychology. Introverts have longer neurotransmitter pathways and are more sensitive to the mood chemicals dopamine and serotonin. As a result, introverts do not require as much external stimulation for internal shots of happiness (known as Hap Hits) and can actually get overstimulated, resulting in system shutdown. Priorities - being OK with saying "No"
Letting your light shine - strategies for success when you are forced to "extrovert"
Overall, I found this book to be very insightful and helpful. I don't get as frustrated with myself anymore when I pause in the middle of a sentence when I can't think of a word. I don't feel guilty for not wanting to get out of bed in the morning (moving requires a great deal of thought and negotiation for innies). I see myself as an asset in meetings, even if my contribution isn't until after the fact when I've had a chance to process the information. The book is quite long, but I highly recommend it. I hope that, after reading it, you will start to think of your introversion as a blessing instead of a curse. I'm coming around.